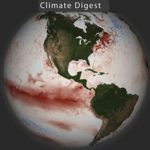 The Climate Digest was originally produced monthly, featuring highlights from NOAA’s global analysis. Our goal was to provide a visually informative summary of the previous month’s global weather and climate for a Climate-Smart Nation. In 2016 we shifted to quarterly Climate Digest products, one for each season. Along with creating Climate Digest for Science On a Sphere (SOS) exhibits, we produce similar YouTube videos for Internet viewing. By watching a quarterly Climate Digest, whether on a large spherical display, computer monitor or mobile device, viewers get a comprehensive seasonal global climate brief in mere minutes.